Filled to the brim with proprietary creamy wax, the Floraison 4 oz. Candlepot is the smaller version of the large Candlepot packaged into a cute colorful box. The creamy wax is combined with handmade perfume fragrance in a soft silky frosted glass; each candle will easily scent a medium to large room with a 35 hour burn time. 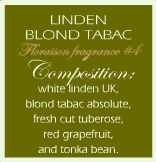 Linden Blond Tabac combines White Linden UK, Blond Tabac Absolute, Fresh Cut Tuberose, Red Grapefruit, and Tonka bean. Its my favorite perfume and is glad to have it in candle form. The aroma is just enough to scent the room but not overpower it! Yummy! Q: why did you discontinue this candle? My favorite scent in the world! I have one by my bedside that I never light, but just leave the top off the beautiful green ceramic holder and have the wonderful scent as aromatherapy around me as I sleep. I have had this candle for over 7 years and the scent is still as good as ever. Please bring it back! Sign-in or Create an Account to earn 60 points for this item. See Rewards Page.